ANSWER: That is about correct. However, it is actually much worse. About 40% of the value of the paper currency of the United States circulates outside the USA. In fact, about 40% of the debt is also held outside the USA. Moreover, the bulk of the money is not just electronic already, but people failed to understand the change in the debt structure. Why do governments even borrow money when they have NO INTENTION of ever paying anything back? Once upon a time, before 1971 under Bretton Woods, it was illegal to borrow against government bonds. That was when the theory emerged that it was LESS INFLATIONARY to borrow than to print. 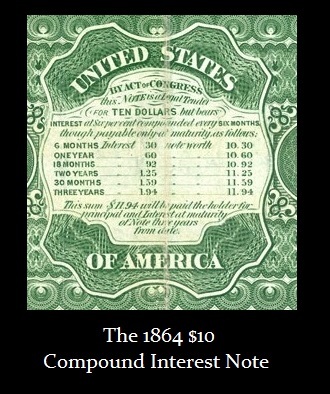 The bonds were not part of the money supply. However, post-1971, you could borrow freely against government bonds. It no longer made any difference to print v borrow. Today, on average, 50%+ of the national debts of most countries is accumulative interest payments. When Federal paper money began, it was really circulating bearer bonds in the United States. In fact, the reverse of the notes displayed the interest you would earn holding that currency. When the government switched to DEMAND notes, dropping all interest payments, this is when the dollar was fondly referred to as a “Greenback” meaning there was nothing but green ink on the reverse side and no table of interest payments. This is when the dollar became paper money and no longer was actually a circulating form of a bearer bond. The government paid interest to encourage people to accept the paper currency and it was introduced during the Civil War to pay for the costs. All this hype about BitCoin and electronic money is a bit strange since most money is electronic. The only distinction that BitCoin actually has is its claim as an alternative form of money separate from legal tender, which means the government will accept that currency in payment of fines or taxes. The bulk of all purchasing transactions are by plastic cards which are comprised of 66% of all in-person sales, with nearly half of them, or 31% are made with debit cards. Welcome to the electronic currency economy. It’s here already. « Bitcoin = Money, Commodity, or Shares?